Inspired by the nuclear disaster at Fukushima in Japan, the reverberations of which are still being felt across the world, Swedish artist Hilda Hellström is creating dishes made from Japanese radioactive soil. According to Dezeen, Hellström got started by contacting Naoto Matsumura, the last person still living in the evacuation zone, to collect soil from contaminated rice fields. 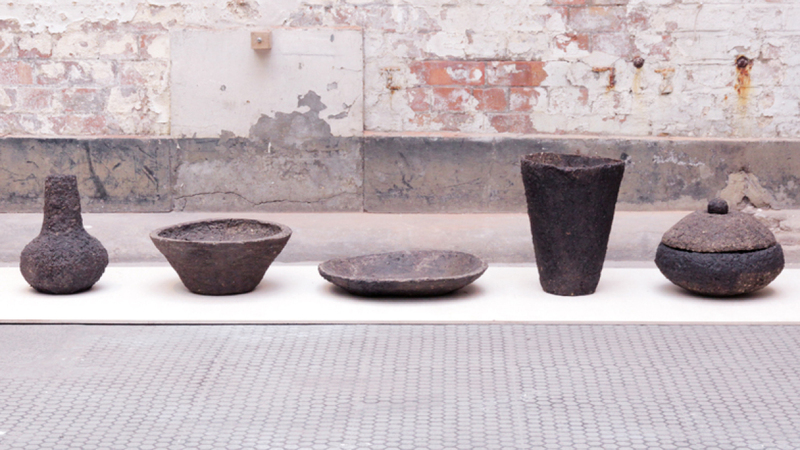 Living day to day with Matsumura, Hellström extracted soil from three inches below the surface and brought it back to the UK she where were molded it into dishes for display at the Royal College of Art in London's graduate show. The dishes aren't designed to be eaten out of. “It is safe to be around,” Hellström said of their materials in an email to Fastco Design. “But…I wouldn’t advise people to eat from the plates.” For Hellström, the value of these creations is more symbolic than practical. The aim with the project, she said, is to "construct an object that speaks of a much larger event than the object itself and inhabits a narrative that goes far beyond its form or function,” Hellström told Dezeen. Powerful as the message and design method may be, would you be willing to display them in your home? After all, eating Cinnamon Toast Crunch from them is out of the question.